Darien High School #21 Will Kirby runs for the goal line past Senator #7 Andrew Trujillo as the Blue Wave takes on Brien MacMahon High School Friday, September 14, 2018, in Norwalk, Conn.
NORWALK – Three-time defending state champ Darien had no trouble disposing of McMahon Friday night, cruising to a 35-0 victory behind three touchdown passes from senior quarterback Cooper Hancock. Darien didn’t punt until late in the fourth quarter and limited McMahon to just 71 yards of offense and four first downs, but the Blue Wave still saw room for improvement as a matchup with state No. 1 St. Joseph lurks next week. Darien scored touchdowns on five of its eight possessions before kneeling out the clock, but the manner in which they failed to score was what left them wanting more. The Blue Wave’s smothering defense set up the offense with tremendous field position throughout the game, which made non-scoring drives feel worse. Their first-half possessions began at their own 47 (Andrew Lucas 30-yard touchdown pass from Hancock), the McMahon 17 (Will Kirby touchdown run), the McMahon 48 (turnover on downs in the red zone), the McMahon 26 (Tyler Herget touchdown from Hancock) and their own 47 (missed field goal). Darien scored on long drives to put the game away in the third quarter, with Hancock and Herget connecting for another score to cap a 69-yard drive and Kirby finishing an 80-yard drive, but it went three-and-out after starting in plus-territory on its lone serious possession of the fourth quarter. For McMahon, the offensive performance was a least a small step up from its season-opening loss to Wilton, in which its Wing-T offense gained only two first downs (including one via penalty) and didn’t advance beyond the opposing 48-yard line. “We had positive things on offense – definitely better than last week,” McMahon coach Jeffrey Queiroga said. “The problem is you can’t have two good plays and one bad play, because then it’s fourth-and-7. There was a couple times where it was third-and-short I was telling our guys, ‘hey, we’re going to go for it on fourth down,’ and then we catch a loss. Hancock. He directed the offense to four scoring drives before leaving the game, and it would’ve been 5 of 6 if the 38-yard field goal was good. McMahon running back Jermayne Daniel. He posed the only threat on offense, gaining 49 yards on seven carries while picking up most of the Senators’ first downs. 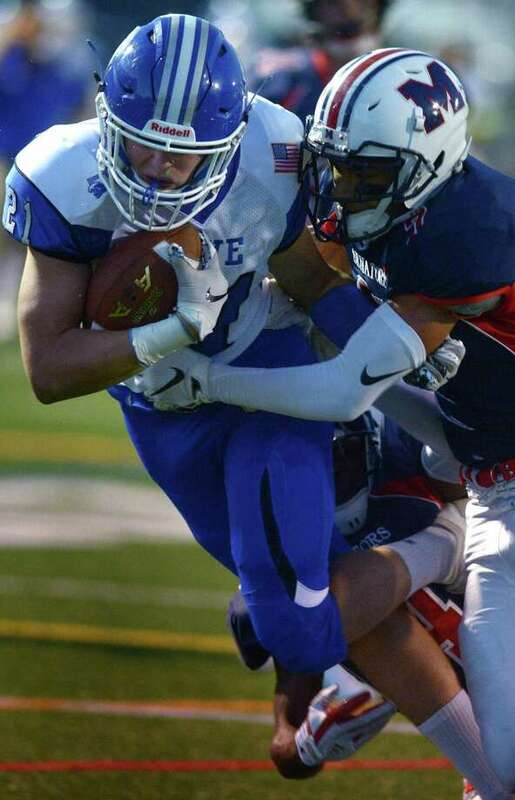 Darien, ranked third in the latest GameTimeCT poll, visits No. 1 St. Joseph at 1:30 p.m. Saturday, Sept. 22 for a high-powered showdown. McMahon travels to Staples at 7 p.m. next Friday.